"That’s funny,” thought Horton. “There’s no one around.” Then he heard it again! Just a very faint yelp. As if some tiny person were calling for help. “I’ll help you,” said Horton. “but who are you? Where?” He looked and he looked. He could see nothing there but a small speck of dust blowing past in the air. I first heard about the fascinating phenomena of Orbs in photographs perhaps twenty years ago, and then several years later I too began to experience Orbs in some of the pictures that I took. From my first Orb photo, I felt as if “something” was making itself known to me. And like so many of my other psychic experiences in life, I just thought, “oh Barb, here is yet another strange thing you’ve experienced that no else does.” What heightened my curiosity was when Orbs began appearing in photos when other people took my picture. Something was definitely happening, but what? As an intuitive, when I looked at the photo’s I knew right away that these were Spiritual Beings coming through and making their prescience known to me and to any one else who viewed the photographs with an open mind. My brother (who was not at the time necessarily interested in psychic phenomena, but who was very interested in the science of photography) happened to take a series of photos at a family gathering. He and I both felt very connected that weekend and also felt as if relatives who had passed on were present and celebrating with us throughout the period that this occurred. 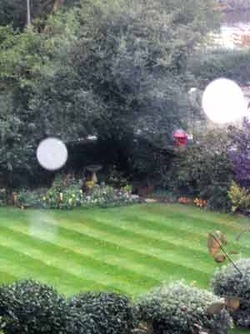 When he processed the pictures from the weekend, there were many pictures with Orbs, Orbs shooting through the backyard and showing up (circling) around my head. Almost every picture with me had some type of Orb in it (they varied in appearance), yet pictures taken of other family members did not have any Orbs in them. When we later looked at the film sequence, there would be pictures with Orbs, then pictures without Orbs and then pictures with Orbs again, and so on – so the possibility of faulty film or camera exposure were eliminated. (Yes, I do think it’s important to eliminate physical reasons like dust particles, raindrops, and problems with film and camera equipment when considering if a picture is a genuine Orb photo or not.) Also, the only pictures that had this phenomenon in it were in the film that he took that weekend. Later shots after this weekend on the same role of film had no Orbs, and my brother has not taken any Orb shots since that event. Although my brother is a serious amateur photographer, at the time he was working for a professional photographer, and he showed the pictures and negatives to this individual, trying to discover the physical or mechanical reason for these objects appearing in the photographs. He also showed the film and developed pictures to several other such professional photographers, and no one could explain the photographs that had Orbs in them. Another odd thing about this occurrence is that this series of pictures keep disappearing around my house. I am a fairly organized individual, and for many years, this set of pictures would simply “disappear” – I wouldn’t be able to locate them, then they would reappear and I would have them for several months, then they would disappear again. To this date I have only a couple of the original series, and my brother can’t locate his copies either. Since these photographs were taken, I have taken new photographs with orbs in them. They have tended to stay available in my photo collection. I am finding that if I am in a spiritual location and I ask to see the Spiritual Beings that I am communing with, quite often they will “show” themselves to me in a photograph by appearing as an Orb. And while all of my Orb photos were taken with an old style 35 milometer film camera, I understand that most people who take Orb photos say it is easier to take them with digital cameras. I do have a digital camera, but have yet to have an Orb appear with this type of camera. I realized that I wasn’t the only person in the world taking such pictures, but I hadn’t run across any people personally who had taken such photographs, except at metaphysical expo’s. So I was very pleased when through spiritual healer and clairvoyant (and who is also a former priest), Ron Roth’s websitewww.ronroth.com, I received word that there was a new book out called The Orb Project, by Miceal Ledwith and Klaus Heinemann. This book comprises a scientific analysis of Orbs and the process and analysis of taking such photography in a technical or scientific way by Mr. Ledwith, and then the more holistic analysis with tips for connecting and producing such pictures by Mr. Heinemann. Also, there are many photographs of their Orb connections so that you may broaden your awareness of the way that Orbs appear or identify that you actually have captured an Orb in your photography. It excites me that such studies are now progressing and this published information is being disseminated throughout the world.